Find out what are the benefits of using a wood burning stove and I bet you’ll have yourself asking why you have not thought about it before. One does not know just how much of an advantage it can be to have a wood burning stove in your home. I fell in love with wood-stoves the very first season I used one. I spent two years living completely off of the grid in a big round house tucked away in a canyon in Northern Arkansas. So, I truly learned how much having one really has to offer. Before I tell you my story, let’s get straight down to business. Do you live in an area where you can harvest and process your own wood? If so, then your heating bill cost is only going to consist of the fuel for the chainsaw (if you use one) and the bar chain oil. Even if you have to pay to have someone haul wood, you still end up paying much less than you would be using propane or electricity to heat. As long as you have good seasoned/dry wood and a good secure stove when the winter storm hits, you’ll be covered. Even if the town loses power, you still have a way to heat your house. This also provides a guarantee in other aspects but that’s on down the list. Whether you have a simple wood-burning stove for heat or a cook-stove, you will have a way to prepare meals if the power goes out and you normally cook using electric. It is also nice backup to have if you run out of propane. 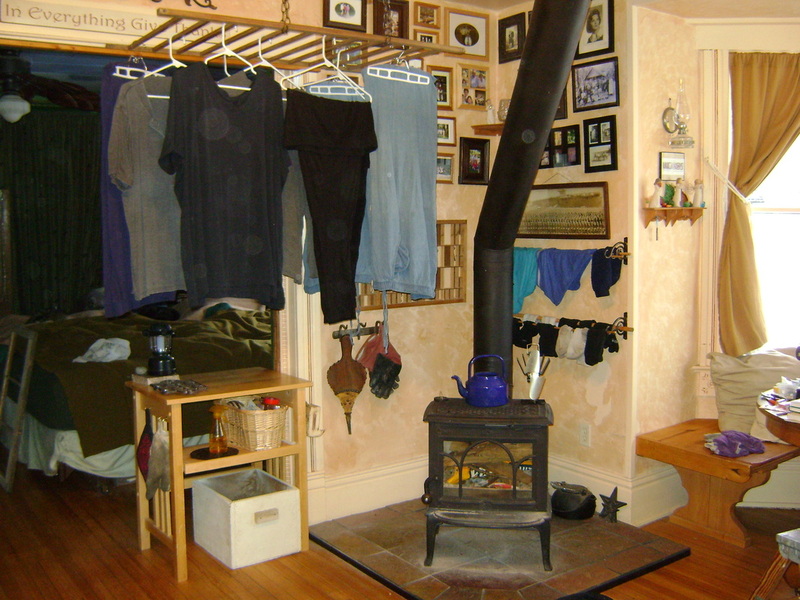 I fashioned a shelf above my wood stove so that when I came in from the rain or snow I could toss my gloves and scarf on so they dry out nicely. It is also convenient to have a coat rack close by for the same reason. This drying rack also works well for drying out veggies and mushrooms as an added bonus. There has always been a debate about whether wood for fuel and heating is better for the environment than coal or oil. The truth is, it is safer on several different levels. The first being that if you buy wood locally there is less oil being used in so many ways. Coal and oil both burn very dirty causing soot build-up in the home and dark smoke to be released into the atmosphere. Coal burns hotter which is one of the main reasons people use it. Unfortunately, this also has its negative side-effects, such as higher risk of house fires. Let’s face it, life happens and when it does, it’s nice to have a back-up. I think we are all somewhat familiar with the water lines freezing in the winter. As long as there is snow on the ground you have a way to get water and as long as you have water you have a way to make it hot. I have had a hot water tank break on me while I was in the shower. I suspected the element was going but was surprised regardless. Having a wood stove at that time would have made things so much easier for me. Want to learn how to start a fire and keep it burning safely in a wood burning stove? It’s a must-know skill for a homesteader, safety first is very important. Check out here Wood Burning Stove Tips | How To Start A Fire & Keep It Burning Safely! This post was originally published in December 2016 and has been updated for quality and relevancy. Another down side to wood stoves, most insurance co.’s here in Indiana want to double or triple your home owners insurance if you have one. Same for fire places. It is also easy to humidify the air using a pan or cast iron pot of water on top of the wood stove. meahwhile back in Britain the government is thinking of banning wood as a fuel – to reduce pollution! I kid you not! !